So you've decided to revamp your website. Great! Your website is often the first interaction a prospect has with your company, so it's worth taking the time to optimize and modernize your web design. But this isn't a decision you can put on the back burner until January. Websites are more complex and expensive than ever, and while the many basic elements of web design have carried over for years, there are a few new schools of thought you need to align yourself with to ensure scalability, efficiency and a top-notch user experience. Here are eight elements, new and old, that you need to start thinking about sooner rather than later for a successful website redesign and development as you head into 2019. Regardless of your industry, brand, style or buyer personas, your main focus in designing a website should be making it as easy as possible for the user to find the content that's relevant to them. That means the navigation should be easy to understand, the interface should be easy to use and the design shouldn't get in the way of the content. That's not to say that the actual design and functionality aren't important — of course your website should be attractive and reflect the personality of your brand — but if a user can't quickly and easily find what they're looking for, they're not going to stick around. Always begin the planning process by defining your primary personas. Even if you think you have a good grasp on your main personas, run back through their major goals and pain points and confirm that they're all still relevant before you begin. Throughout the development process, avoid the tendency to think of the website as something you're creating for yourself. Rather, it's for your personas — so if you're ever debating a major change or trying to narrow down your options, consider their needs first, not your own preferences. This ties back into the first two points, but it's worth repeating: this website is for the user, not for you. Put yourself into your personas' shoes and ask yourself: Which phrases and keywords would they search to land on this page? Which solutions, messaging, links and style would appeal most to them? What content would they find helpful? Answering these questions thoughtfully and accurately will help you create a targeted, persona-centric website that attracts the right visitors, directs them to the right content and delights them with a seamless user experience. Consistency has always been key to creating an attractive, helpful and easy-to-use website. To avoid confusing or frustrating users, ensure that the main components of a site, such as the navigation and the color scheme, remain consistent across every page. This also includes consistency across browsers and device types. Your visitors could be accessing your site from anywhere — Google Chrome or Internet Safari; an old PC or an iPad; a huge desktop screen or a tiny smartphone — and the website should work from a myriad of devices and locations. In the past, this was a nice-to-have element of web design, but now, it's a requirement. Marketers expect to be able to maintain the meat of the website without the aid of a developer. If they want to change the background color or add new sections, marketers should be able to do that on their own, and their editing view should be just as polished as the front end of the website. We'll admit it — this is tough. Developers have to find the balance between a flexible website and one that's bulletproof. They need to give the marketer options for different use cases within the editing view, but at the same time, they also need to set up guardrails so the marketer can't accidentally break something when trying to change an icon or edit copy. Both are modern requirements. The field of web design has seen a major shift in mindset recently. For years, developers thought of the scope of a web design project in terms of the page count. Later, they began to think of it in terms of how many unique templates a website will need — for example, home page templates, about page templates or solutions page templates. Now, instead of a template-based approach, developers are taking a modular approach to web design using overarching design systems. Design systems are collections of individual modules that conform to consistent visual rules about typographic styles, color swatches and brand elements. Modules are the self-contained reusable components of a website which can be used in any number of templates — and the cool thing about this is that developers can go back and combine these modules to create new templates in the future, without having to go back deep into the code. This approach to web design allows for more efficient scaling, easier continued maintenance and future adjustments. There are many different design systems you can work with, and ultimately, it doesn't matter which one you choose as long as you have one. At New Breed, we use an advanced version of CSS called Sass, which lends itself perfectly to this design system approach. Sure, we always cared about page speed. But with more and more people browsing on mobile devices — which typically have a slower connection than desktop computers — page load times are becoming a critical factor in keeping users' attention. In fact, a study by Google noted that more than half of mobile users will leave a webpage if it doesn't load within three seconds. In this age of instant gratification, users measure your company's credibility by the time it takes your pages to load, and three seconds is a short window of time to make a good impression. If that weren't enough, consider this: Google also weighs page load times more heavily than SEO. The slower your page loads, the lower your page ranks in Google searches. Remember, you may have high hopes for an attractive, easy-to-use, functional website — but you'll never know how effective it really is until you test it. Always go into a website redesign with the mindset that you're going to continuously test and improve on it, not just let it sit. Once you've launched your site, immediately begin testing it with key maps, A/B testing and user data collection, and keep your eye out for areas of improvement. Treat your website like software that needs to be continuously updated with new features and enhancements. Some of these ideas have been around for decades, but some of them are emerging must-haves in the industry. The planning process for a redesign is going to be long and involved, but taking the time to plan effectively is sure to save you time, money and effort in the long run. By considering your personas; maintaining consistency; and developing for flexibility, scalability, speed and ease of use; you're well on your way to a successful redesign for 2019. Bottom line: Good developers create an effective website. 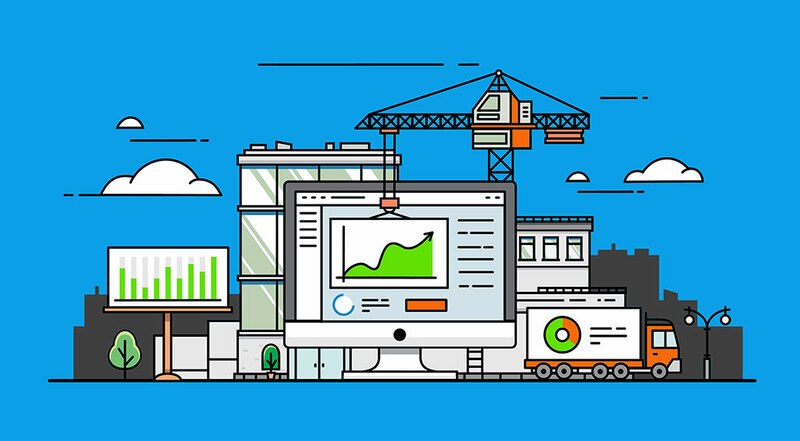 Great developers create an effective website, measure the effectiveness of that website over time and continue to make improvements for functional sustainability. We'd like to wish you good luck on your upcoming redesign — but if you keep these ideas, and our 10 steps to website redesign, in mind throughout the entire process, you won't need it.